The RAF is the world’s oldest independent air force; when it was formed on 1 April 1918 it was also the most powerful. Commanding at its peak a formidable 20,000 aircraft and 300,000 personnel, it has been the backbone of British military strategy in every theatre of modern warfare. It’s no wonder the Royal Air Force captures the imagination in a truly unique way. To commemorate its centenary in 2018, pilot’s watch specialist AVI-8 has created a series of highly collectable timepieces that pay tribute to different eras of the RAF. Rather aptly based on the brand’s signature Flyboy range, each limited edition will incorporate design features from major decades in the force’s history: the 1920s, 1940s, 1960s and 1980s. First up are the editions from the 1920s and 1940s. Available to pre-order from 7 March, everyone who signs up for the Centenary Watches will receive a unique code for additional discount on the watch. The watches will start shipping on 26 March. Taking its inspiration from the early military styles worn by pilots, the 1920s iteration bears more of a resemblance to classic pocket watches. It features a 42mm case and oversized serrated-edged pumpkin crown – necessary for pilots to be able to adjust their timepieces while wearing gloves – with the iconic blue and red circles of the RAF as a gemstone. The dial is a wonderful homage to the era in terms of both typeface and design. The neo-Gothic-style numerals are enlarged and luminescent for easy legibility during night missions (whether you’re in a cockpit or the back of a taxi), a clarity that is enhanced by the railroad markings for the minutes and the substantial hands. The slightly offset sub dial at 4 o’clock, rather than at six, is also a thoughtful piece of design that marks this timepiece out as something more than just a slavish reboot. Obviously an element of modern watchmaking has to prevail so powering these vintage beauties is an up-to-date Miyota movement, which has been customised with a ‘Centenary’ edition rotor, while the stitched strap adds that final retro touch. A lot can happen in 20 years of watch design – the most important thing being watches were liberated from pockets and attached to wrists. That major shift can be seen in the design of AVI-8’s 1940s-inspired limited editions. The advent of World War II and rapid global militarisation led to a no-nonsense, functional aesthetic when it came to pilot’s watches. They had gone from being nice extras to becoming an integral part of the kit. Here, you’ve still got quintessential pilot’s watch details – such as the onion crown, railroad-track minute counter, seconds sub dial and luminescence – but the numerals are sans serif and only show at five-minute intervals, while the hands are sword shaped rather than squelette and the strap is a more substantial buffalo hide. In keeping with this spirit of advancement, the Miyota movement with its unique Centenary rotor can now be seen through a sapphire caseback. AVI-8’s knowledge of both aviation and pilot’s watch design is writ large in these limited editions. 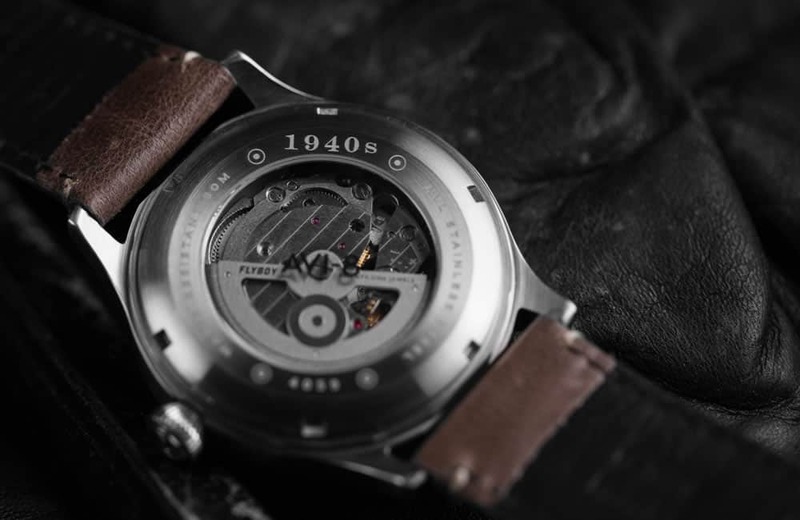 Founded in 2006, the brand is a collaboration between Dartmouth Brands, which owns watchmakers such as Earnshaw, and a group of aviation industry professionals. The mission was to create a collection of aviation-inspired timepieces that didn’t have the kind of price tags associated with the brand leaders in this arena. You almost always have change from £500 with AVI-8, the majority of timepieces flying in under £250. Each collection (bar the Flyboy), is named after iconic British aircraft with an aesthetic to match – the Hawker Hurricane has a more classic look, while the Supermarine Seafire, for example, has a post-war modernity. You have a pick of quartz or automatic movements and every timepiece has that reassuring robustness you’d expect from a watch inspired by the derring-do of Britain’s finest. Which is why it is perfectly positioned to commemorate this landmark year in the RAF’s history. The automatic-only collections will be launched throughout 2018 with those who get in early having the option of owning a truly bespoke collection with a watch from each era. Being limited editions, AVI-8 is adamant that once they’ve all flown out the door, there will be no more reissues. Whether you’re an RAF enthusiast, a lover of pilot’s watches or a just a chap with excellent taste, these AVI-8 limited editions are the ideal addition to any watch wardrobe. Goggles and sheepskin bombers optional, of course. 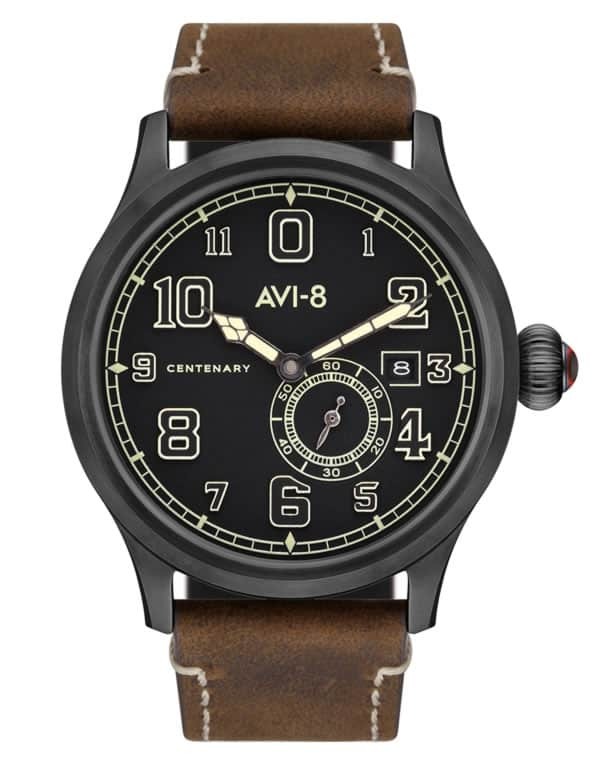 You can pre-order the 1920s and 1940s centenary watches now online at avi-8.co.uk. The full RRP of the watches is £249.00 but the pre-order price is £199.00 (available 7 – 21 March). Pre-order ends 21 March; from 22 March onwards the Centenary watches will be available at full RRP only.